This is the first of three posts on Dublin, Ireland. For those who don't know, Dublin's where the Guinness comes from. In fact, the first photo of me in the About Me section is a shot of me drinking Guinness at a pub called "Graingers". Graingers and Guinness will be the third post in the series, with the Paddy's Palace hostel holding down the middle ground. Onward! Closing Time: Even more so than Austin--dare I say, "even more so than NYC"?--Dublin truly is a 24-hour city. I spent many nights wandering the quays, hanging out at internet cafes and meandering from pub-to-pub. The night never ends in Dublin... at least not until the sun decides to break up the party. It's a fairly drunken party... and it's alotta fun. A Scuffle in the Paddywagon: On one such night out, I was innocently enjoying a cancer stick outside of an internet cafe when a police van pulled up 'n parked next to me. Bracing myself, I was pleasantly surprised when the officers who jumped out didn't even bother looking at me. Instead, they took off running down the alley just past the cafe. I made a quick mental list of any crimes I might've committed while in Dublin, then decided that it was worth it to enjoy the last of the smoke before calmly leaving the area. The street--still busy with crowds at one in the morning--grew even busier as peeps emptied outta the alley... and as two police cars parked in front of the van. When the police returned from the alley, they were forcefully escorting a very stocky Irishman who's gaze and swaying stride spoke of many a fine hour drinking. He seemed more confused than annoyed... at least, until they got him in the van. I couldn't see the inside of the paddywagon from where I was standing, but there was no missing the fact it had jolted and begun swaying from side-to-side. The officers in the cars jumped out and ran to the van. That's when the wagon really started jumping around... and, a second later, an officer flew backwards out of the van. Now, I consider myself a good fighter, but I'd seen the guy they were tryin' to arrest. The guy was big... 'n we're not talking fat. Also, drunks have the advantage of an increased pain threshold. There was no way I was taking this guy if he got out and found me in his way. I decided to move into the doorway of the internet cafe... bound 'n determined to see how this played out. As another officer flew out of the back of the van, the brawler emerged with a leap. He barely stumbled before taking off down the street. The crowds parted to make a path for him, as they'd obviously either seen the guy fighting already or had made the same measure as I had. The police split into groups, two of 'em checking on the two that were downed while the other two took off running after the brawler. An hour later, the officers returned to the van empty-handed. Arms Dealing: On another night, a Scotsman in a pea-coat bummed a smoke off o' me. When he heard my accent, he asked, "You're an American? Have you any arms connections? Guns?" A bit surprised, I decided to play into the stereotype that all American have guns, saying, "Not immediately. What kinda quantity are we talkin' here?" Turning suspicious, he said, "Fairly large shipment, but small arms. Concealables." Yes, I'd definitely taken it to far... 'n decided to end it, shaking my head and saying, "Hmmm.. . I'm gonna be a dead end on this one... but keep looking." He thanked me for the smoke and bowed out. 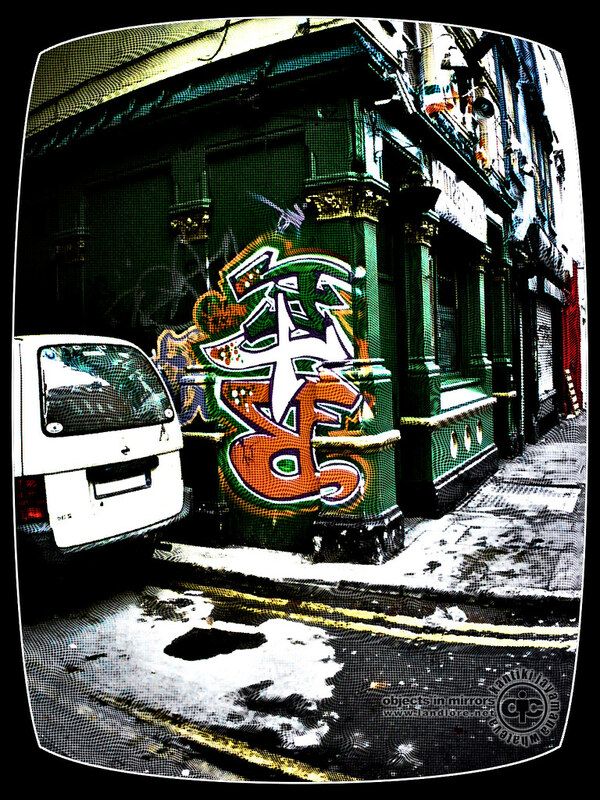 Graffiti: Irish graffiti, such as that in the opening photo, bears a lot of similarities to the wildstyle paintings of the American South-West. However, it plays off the color palette that Ireland is known for: vibrant emerald greens, burning oranges, stark whites and flares of red for highlights. On one of my next trips to Ireland, I'll be spending a few days capturing some of the best graffiti that I can find. Interesting Connections: In a strange way, Dublin easily reminds me of a mix between Austin, Texas and Villahermosa, Mexico; but with the cold weather that comes with the United Kingdom; and with a culture that is entirely unique to Ireland. I can see why it's been referred to as the sister-city of Austin.